Today, I will teach you how you can increase your will power, how you can control your mind, how can you control your diet, your mind that runs into many direction. We will teach you how to control from it. First of all, you should know what are the benefits of increasing willpower. With increasing willpower, you not only control your mind but it also breaks your bad habits. With this, you can save from your bad addictions. Suppose, you take a lot of tea or take lots of sugar, it will help you control them. So, today, we will teach you how to increase it. See, our actions reflect our decisions. Suppose, we take a small action that we have to study or that we have to quit smoking or gambling. You will find that your mind can be honest for one minute. So, you have to make your mind honest for one minute. 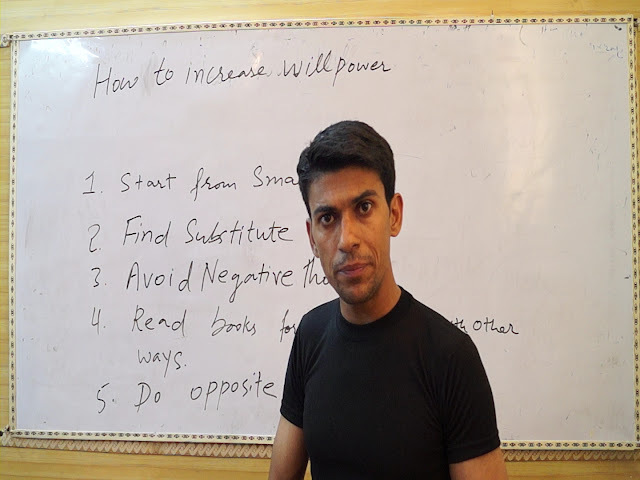 The meaning of increasing willpower that if your mind can be increase honest for one minute, it can be honest for one hour, you can increase it from one hour to one day, from one day to one week and so on. So, you have to advanced slow by slow. If you are feeling difficulties in studying, concentrate your mind for one minute initially, then for one hour and then for one day. If you are able to concentrate for one minute, it means that your willpower is increased by one day. You have to find the substitute of your bad habits. For playing the gambling, you can play good video or music. For taking lots of sugar, you can get its good substitute. Meet your friends, going to some good place etc. That will also add to your willpower to stop bad habits. You have to fill your mind with positive thoughts and good dreams. With this, there will not any place for negative thoughts in your mind. Suppose you want to become rich through gambling but there can be many good ways of becoming rich, then why to adopt the gambling to become rich. Reading good books will provide you good knowledge that motivate you towards your goal of becoming rich. If you feel like eating sweet, eat salty. If you feel like going out, you go to bed. If you feel like having drinks, you take boiled water. You do the opposite. In this process, either you or your mind will be defeated. You have to win, you have to have your own way , because you will be tempted by your mind. It has been said "Good helps those who helps themselves." If you follow these steps, I hope you will be able to increase your willpower greatly for your good use. No Comment to " How to Increase Willpower ( in English ) "